I wish to stress one thing in particular. There is a marked difference in associative supersyllabograms, which account for the greatest number of SSYLS in Mycenaean Linear B, and attributive supersyllabograms, which appear primarily in the textiles and vessels (pottery, amphorae, cups etc.) sectors of the Late Minoan III & Mycenaean economies. Associative supersyllabograms inform of us of some element, usually a land tenure factor, which relates to the ideogram itself, or which circumscribes its environment, especially in the livestock raising sub-sector of the agricultural sector. For instance, the supersyllabogram O, which you see in this Appendix, plus the ideogram for sheep + the number of sheep accounted for in the inventory of any particular tablet, informs us that the sheep are being raised on a lease(d) field, more specifically a usufruct lease field (i.e. a lease field which a farmer tenant cultivates for the use of his own family and village neighbours, with a taxation imposed by the overseer). In other words, the supersyllabogram is associated with the raising of x no. of sheep. The scribe could have simply informed us that x no. of sheep were raised, and left it at that. But he did not. By adding just one syllabogram, in this case a simple vowel = O, he has given us a great deal more information on the raising of the sheep (rams & ewes) on this particular tablet. And he has done all of this without having to resort to writing it all out as text. Since it was critical for the scribes to use as little space as possible on what were (and are) extremely small tablets, the use of supersyllabograms as a substitute for wasteful text is illustrative of just how far the scribes were willing to go to save such invaluable space. They did not do this only occasionally. They did it a great deal of the time, and they always followed the exact same formula in so doing. Not only are syllabograms such as O (on a lease field), KI (on a plot of land) & NE (in their sheep pens) in the field of sheep husbandry associative, they are all what I designate as dependent supersyllabograms, since they are meaningless unless they are immediately adjacent to the ideograms they qualify. No ideogram, no supersyllabogram. Period. This comparison between the real tablet from Knossos using only supersyllabograms and ideograms (left) and a putative one using text in full (right) is precisely the reason why so many scribes much preferred the former formulaic approach to inscribing tablets to the latter discursive and space wasting technique. A textual version of this tablet would have been twice as long as the actual tablet. 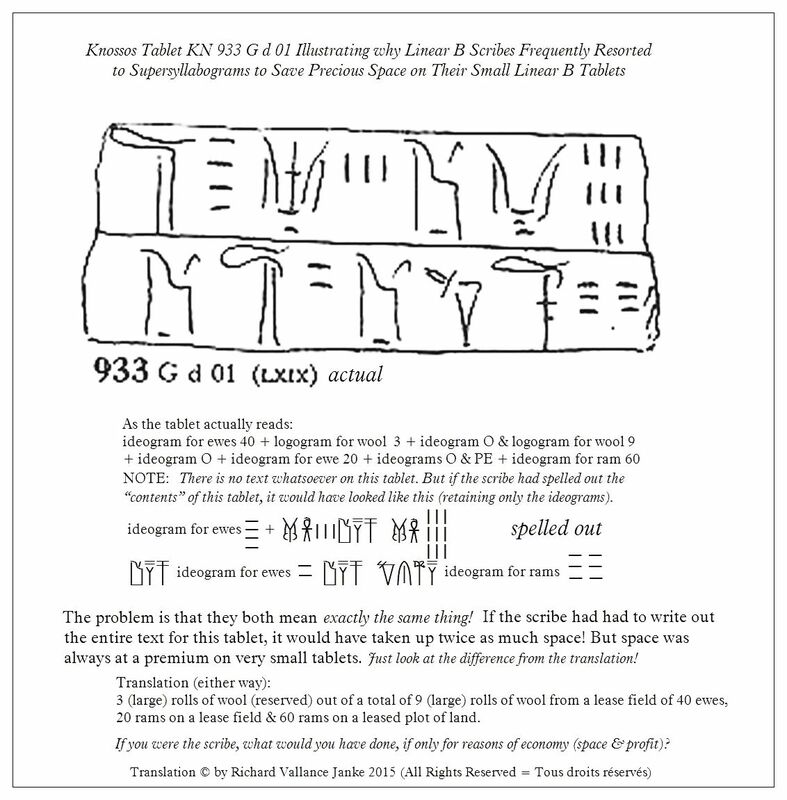 Even if no one nowadays has ever managed to decipher dependent supersyllabograms until now, that cannot conceivably mean that the Linear B scribes did not know what they were, since otherwise, they would never have used them so liberally in the first place. In other words, using SSYLS for no reason at all is tantamount to a reductio ad absurdum. 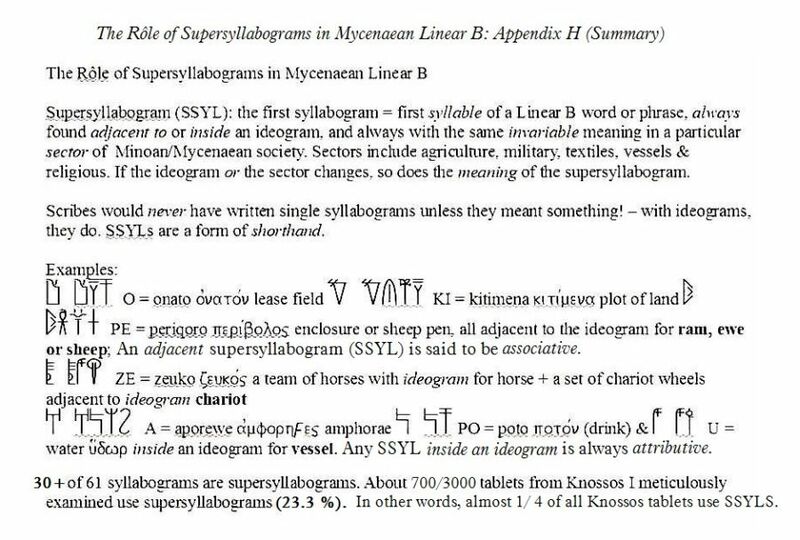 There are thousands of supersyllabograms found on 700 tablets from Knossos. They are there because all of the scribes, as a team or, if you like, as a guild, all understood each and every supersyllabogram to mean one thing and one thing only in its proper context. In other words, supersyllabograms are standardized and always formulaic. This should come as no surprise to anyone familiar with Homer, who also heavily relied on formulaic expressions, though for entirely different reasons. My point is that formulaic language is a key characteristic of ancient Greek texts, right on down from Mycenaean times through to Attic and beyond. We should never overlook this extremely important characteristic of ancient Greek, regardless of period (1450 – 400 BCE). Attributive dependent supersyllabograms always appear inside the ideogram which they qualify, never adjacent to it. They always describe an actual attribute (usually known as an adjectival function) of the ideogram. For instance, the syllabogram PO inside the ideogram for “cloth” is the first syllabogram, i.e. the first syllable of the Mycenaean word ponikiya = “purple”, hence the phrase = “purple cloth”. Likewise the syllabogram TE, when it appears inside the ideogram for “cloth” is the supersyllabogram for the Mycenaean word tetukuwoa, which means “well prepared” or if you like, “well spun”. Hence, the syllabogram TE inside the ideogram for cloth must mean one thing and one thing only, “well-prepared cloth”. I have discovered, identified & classified well over a dozen examples of associative supersyllabograms. Neither type of dependent supersyllabogram, associative or attributive, was ever isolated and tabulated in Mycenaean Linear B until I systematically studied, deciphered and classified scores of them on some 700 tablets from Knossos.